This fall, the Resistance will live to fight another day on the small screen. The Hollywood Reporter brings word that Star Wars Resistance has been renewed for a second season on the Disney Channel. The series is currently in the middle of its first season, which resumes after a month-long hiatus on January 13. Star Wars Resistance originally premiered back in October and it is set six months before The Force Awakens. Kazuda Xiono, a young New Republic pilot, is the main character of the series. Poe Dameron personally recruited Kazuda to join the Resistance in their fight against the burgeoning First Order. Aside from Poe, several other characters from the Star Wars universe have made recurring appearances on the series. Some of these familiar faces include Captain Phasma, C-3PO, BB-8, and General Leia Organa. Gwendoline Christie, Anthony Daniels, and Oscar Isaac reprised their live-action roles as Phasma, C-3PO, and Poe, respectively. Despite an initially negative reaction to its animation style, Star Wars Resistance has garnered decent reviews. It has also become a major staple of the Disney Channel’s Sunday night lineup. The series was created by Dave Filoni, a veteran of both Star Wars: The Clone Wars and Star Wars Rebels. Filoni is also executive producing and directing the first episode of The Mandalorian, the upcoming live-action Star Wars series for Disney+. Additionally, Filoni is also overseeing The Clone Wars for a new season of 12 episodes; which will air on Disney’s new streaming service. Ahead of its return on Sunday, January 13, Disney has also released a trailer for Star Wars Resistance‘s mid-season premiere. The latest footage notably features General Hux as well as Kylo Ren’s Command Shuttle. 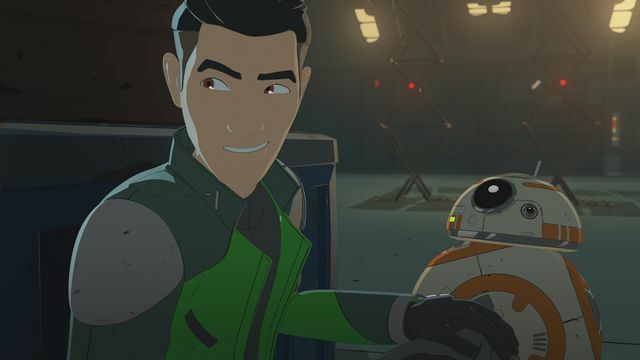 Are you excited about Star Wars Resistance coming back for a second season? What other Star Wars characters would you like to see included in future episodes? You can check out the new trailer below, then tell us what you think in the comment section!